West Bengal Chief Minister Mamata Banerjee today announced that Kalimpong would be made a new district and said the overall development of Darjeeling hills was her government's top priority. “We have allotted Rs six crore for building infrastructure.We are awaiting a nod from the judiciary to curve out Kalimpong as a separate district with Mirik a new sub-Division to boost development activities in the area”, she said at the annual convention of Lepcha Development Board here. Stating that the state government has so far incurred Rs 119 crore for development in the hills, Banerjee said that her government would encourage more development and promote more tourist spots including Tiger Hills to attract large number of tourists. she said. “Municipal elections in the hills would be held.Those who win must work for development.We (Trinamool Congress) don't have any MP, MLA or councillor in the hills. It hardly matters about who wins the election. Development is our top priority. If we win we shall work hard for development in the hills and if any other party wins we must assist them for development,” Banerjee said. of our government is clear development for the hills. Hills must keep smiling,” Banerjee said. “I am proud of the young generation of the hills. 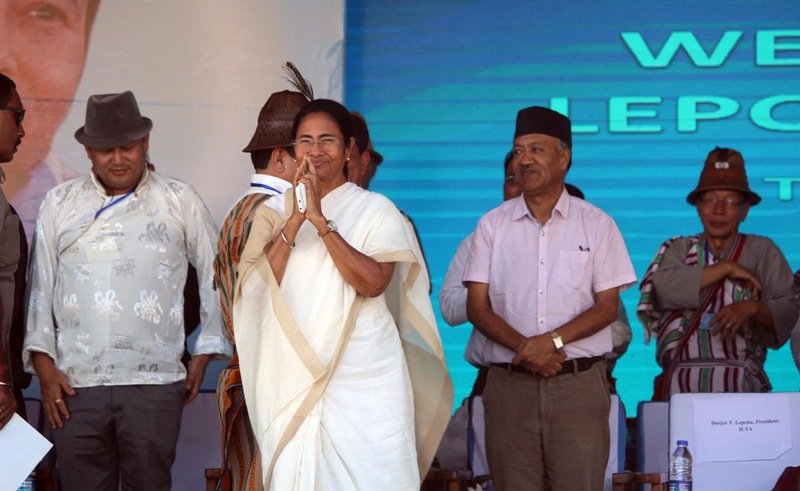 If hills do not progress, Bengal cannot progress,” she said. she was welcomed by the people in the hills as 'Pahari Ma' (Mother of hills). She also met representatives of different tribes in the hills, while lauding performance of different Boards set up in the hills during her tenure. 4 Respones to "DEVELOPMENT OF HILLS IS TOP PRIORITY OF MY GOVT: MAMATA Kalimpong to be a separate district"
Agreed! GJMM'S impotency has lead to what we are witnessing. I am not so fond of Gorkhaland but I do support "a state of separation from bengal" "a state of self governance". Hello, firstly I would like to inform the readers that Mamta Banerjee is in the hills of Darjeeling as the Chairperson of Tribes Advisory Committee and not as the C.M of Bengal. And as for Kalimpong becoming a district, she can try her luck at the High Court, Calcutta under section 7 of the Cr.P.C and if High Court grants her a favourable order then she is free to do so. And again what is she gonna do about Kurshiong because that division does not have a sessions court, as prescribed under section 7. But again here is something for all you readers to ponder about, as Mamta Masi said no one asked for a District, she decided to give it her self(doesn't she understands the law).